Discount has been applied to RRP. Order valid for a limited time only. 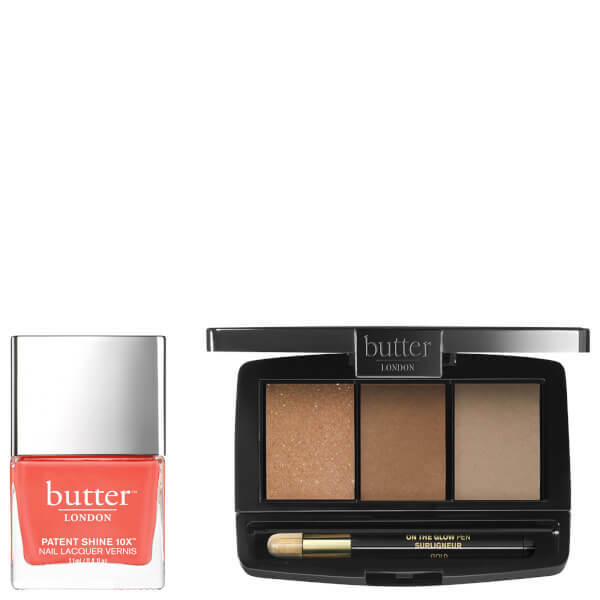 butter LONDON Jet Setter Set combines an opaque coral nail polish and a neutral bronzing palette to help you achieve professional-looking results. A fade-resistant, fast-drying bright coral crème that applies effortlessly to deliver chip-resistant colour with a gel-like cushioned effect for up to ten days. Fortified with patented Shock Resistant Polymer Technology to prevent chipping and peeling, its unique formula coats nails in long-wearing colour with mirror-like shine, whilst its dense curved brush applicator allows full coverage for a professional finish. Infused with Bamboo Extract and Diamond Powder, the nail varnish promotes smoother, stronger and healthier nails with every use. Free from Formaldehyde, Formaldehyde Resin, DBP, Toluene, Camphor, Ethyl Tosylamide, Xylene and TPHP. A sleek compact that houses three universal shades of bronzer and a gold highlighter pen for a subtle strobe of light. Suitable for all skin tones, the creamy, primer-infused powders blend effortlessly onto skin to deliver long-wearing, natural-looking colour that illuminates and brightens your complexion. Ideal for adding depth and dimension to the cheekbones, brow bones, chin and nose, you can achieve a sculpted, contoured makeup look with a lit-from-within glow. Nail Polish: Apply one coat of lacquer, let dry. Apply second coat. No base or top coat needed. Palette: Apply bronzer shades to the cheekbones and hollows of the face. Use highlighter to accentuate the high points of the face. Nail Polish: Butyl Acetate, Ethyl Acetate, Isopropyl Alcohol, Nitrocellulose, Tosylamide/Epoxy Resin, Acetyl Tributyl Citrate, Benzophenone -1, Styrene/Acrylates Copolymer, Stearalkonium Hectorite, Malic Acid, Citric Acid, Bambusa Vulgaris (Bamboo) Extract, Ethyl Trimethylbenzoyl Phenylphosphinate, Diamond Powder, Polymethylsilsesquioxane, CI 77891 (Titanium Dioxide), CI 19140 (Yellow 5 Lake), CI 15850 (Red 6 Lake). Sun Kissed: Mica, Talc, Octyldodecyl Stearoyl Stearate, Silica, Caprylic/Capric Triglyceride, Theobroma Cacao (Cocoa) Seed Butter, Tocopheryl Acetate, Stearic Acid, Dimethicone/Vinyl Dimethicone Crosspolymer, Triethoxycaprylylsilane, Dimethiconol, Sorbic Acid, Isopropyl Phenylhydroxypentene Dihydroxycyclopentylheptenate, Sodium Dehydroacetate, Tin Oxide, CI 77891 (Titanium Dioxide), CI 77491 (Iron Oxides), CI 77492 (Iron Oxides), CI 77499 (Iron Oxides), CI 77163 (Bismuth Oxychloride). Sun Baked/Sun Shadow: Mica, Talc, Octyldodecyl Stearoyl Stearate, Caprylic/Capric Triglyceride, Theobroma Cacao (Cocoa) Seed Butter, Tocopheryl Acetate, Stearic Acid, Dimethicone/Vinyl Dimethicone Crosspolymer, Triethoxycaprylylsilane, Dimethiconol, Sorbic Acid, Isopropyl Phenylhydroxypentene Dihydroxycyclopentylheptenate, Sodium Dehydroacetate. May Contain: CI 77891 (Titanium Dioxide), CI 77491 (Iron Oxides), CI 77492 (Iron Oxides), CI 77499 (Iron Oxides), CI 77163 (Bismuth Oxychloride). On the Glow Pen (Gold): Mica, C12-15 Alkyl Ethylhexanoate, Hydrogenated Vegetable Oil, Triethylhexanoin, Caprylic/Capric Triglyceride, Myristyl Lactate, Ceresin, Silica, Hydrogenated Castor Oil, Methicone, Stearalkonium Hectorite, Propylene Carbonate, Hexylene Glycol, Phenoxyethanol, Caprylyl Glycol, Tocopherol, CI 77891 (Titanium Dioxide), CI 77491 (Iron Oxides), CI 75470 (Carmine).